Recently, I’ve been a bit caught up in old Kung Fu movies. Shorting any technical explorations, I have instead been diving head-first into any and all Netflix accessible martial arts masterpieces from the 70’s and 80’s. While I’ve definitely been enjoying the films, I realized recently that I had little context for the movies I was watching. I wondered if some films, like our latest favorite, Executioners from Shaolin, could be enjoyed even more, with better understanding of the context in which these films exist in the Kung Fu universe. 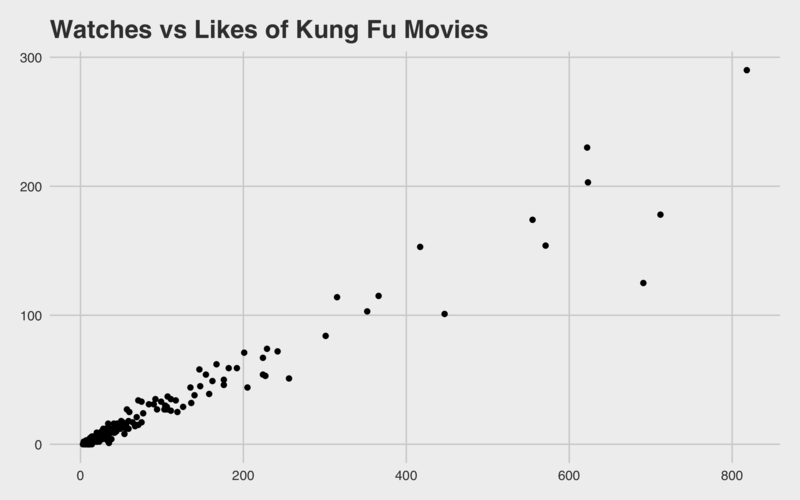 So, I began a data driven quest for truth and understanding (or at least a semi-interesting dataset to explore) of all Shaw Brothers Kung Fu movies ever made! For those not dedicating some portion of their finite lives to these retro wonders, the Shaw Brothers Studio is the most famous (to me) Kung Fu film producer of all time. Their memorable title screen is almost always a part of my Kung Fu watching experience. I figured this company’s entire martial arts collection would provide for a consistent and thorough look at the genre. Fortunately, after a bit of searching, I stumbled on what appears to be a comprehensive list of Shaw Brothers Films. I decided to pull down details for each of these movies from the amazingly useful Letterboxd movie-list-creation site to explore them in a data driven way to see what patterns could be discovered and what context I could learn from those patterns. So here is a bit of data exploration fun. The analysis is in R, using tips and tricks from Hadley Wickham’s wonderful new Data Science in R book. The full analysis code can be found in this R Notebook, which includes the code and graphs in an integrated format. And (spoilers! ), the end Actor Collaboration Network and the rest of the code can be found on github. Come for the Kung Fu, stay for the word embedding and interactive networks! 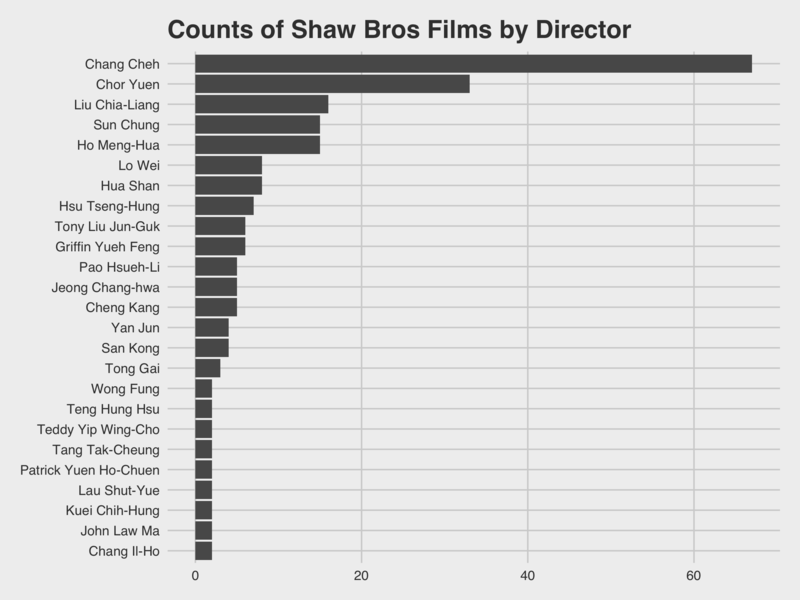 To get started, here is a look at the count of Shaw Brothers films by year. I’m using the wonderful theme_fivethirtyeight for these charts. Someday, I’ll make my own. That’s 260 films over 22 years. The first Kung Fu Shaw Brothers film in this data set is Temple of the Red Lotus from 1965. From the reviews, it sounds like it was a bit rough around the edges - but that’s about what you would expect from this burgeoning genre. The studio hits its stride in the early 70’s, with a lull in the mid 70’s and another spike in the late 70’s / early 80’s. Keep in mind that even during the lull, most years the studio is still putting out 10 or more Kung Fu movies. # the variables we want to explore. Which Shaw Brothers Film should I watch? If you are just getting started with the Kung Fu classics, 260 movies can be difficult to wade through. How do you get to the best of the best to make your initial experience in this genre a pleasant one? Well, we can use the Letterboxd “watches” and “likes” metrics to help winnow down to the films that are the best bang-for-your-buck. Some of the raddest fights from any Shaw Bros films I’ve seen (specially that last one). I haven’t seen this one yet, so I can’t comment - but it’s definitely on my list! We have the director for each movie in our dataset, let’s look to see if there are any popular standouts. I’d say! Chang Cheh directed 67 or roughly 26% of all Shaw Brothers Kung Fu! According to his Wikipedia page, he was known as the “The Godfather of Hong Kong cinema”, and rightly so - at least in terms of quantity. 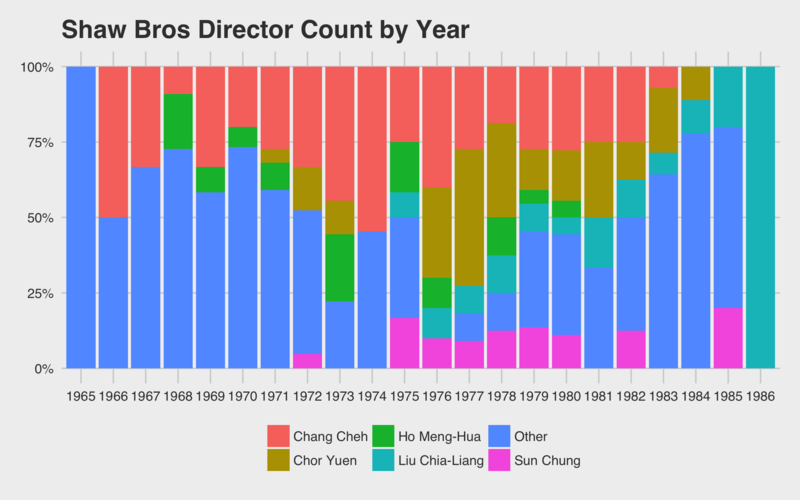 Let’s pull out the top 5 directors, in terms of movie count, and see when they were most active. 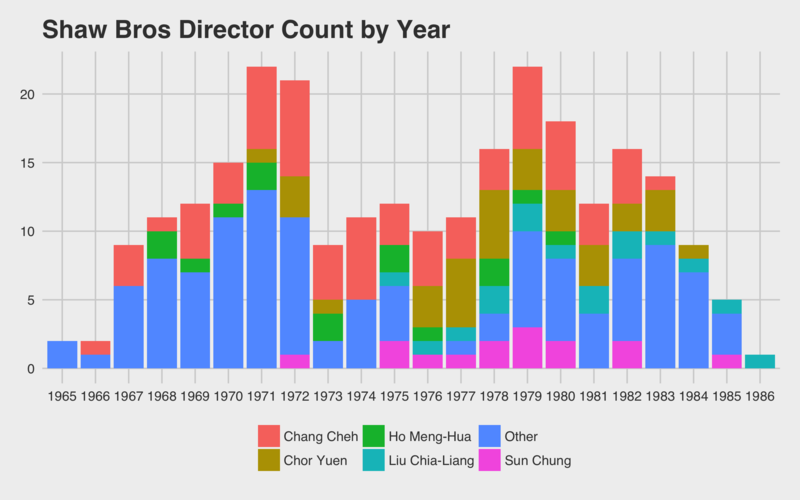 This shows how dominate Chang Cheh was in directing nearly half of Shaw Brothers films in some years. In the mid and later years, Chor Yuen came in to direct many films as well. We will get to the actors in these films in a second, but first I wanted to explore the words used in the titles of these movies. These classic Kung Fu films typically have thrilling and mysterious names, like The Thundering Sword and The Invincible Fist. I wondered if there were any terms used frequently in titles, common threads or themes that became popular in the genre. As I really wanted a chance to play a bit with the exciting new tidytext package, I decided to use it for this very simple text analysis. This package works well to extract text-based data into a format ready to be analyzed and parsed with dplyr, ggplot, and other packages from the tidyverse. Here is how to split the titles column of our dataset so that each word is a separate row in a new data frame. # with a row for every token (word). anti_join is part of the dplyr package. 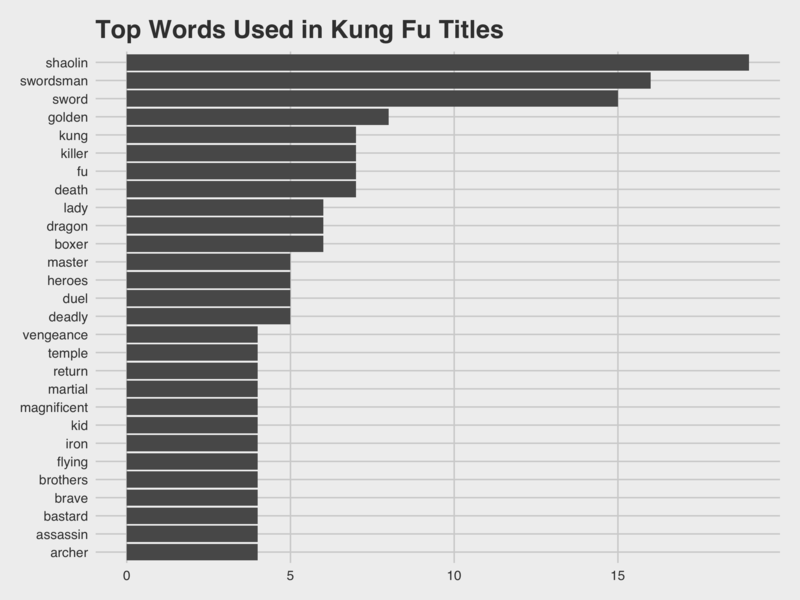 Let’s take a look at the most frequently used words in these Shaw Brothers films. Interesting! Our latest two films from my Netflix history were the afore mentioned Executioners of Shaolin and Shaolin Martial Arts, but I hadn’t realized “Shaolin” movies were so prevalent in the Shaw Brothers cannon. 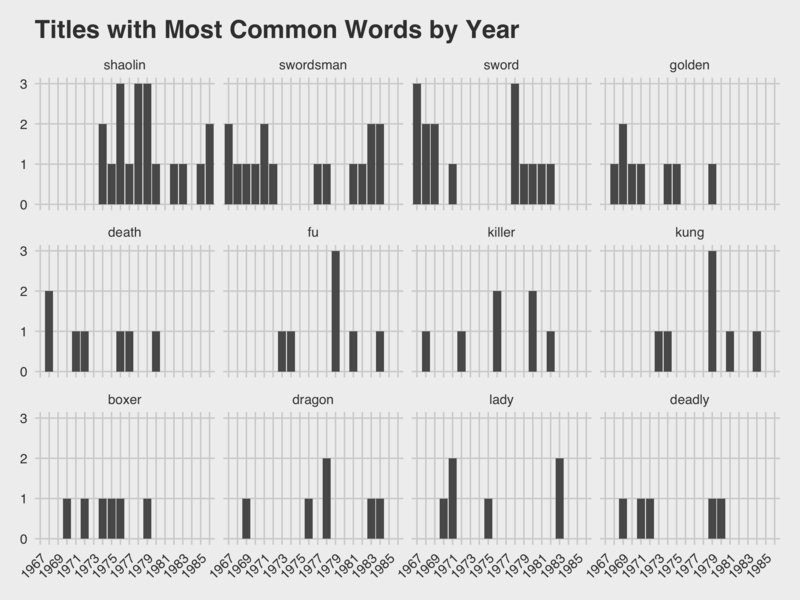 Also interesting is the number of “Swordsman” movies - a term I don’t remember seeing yet. 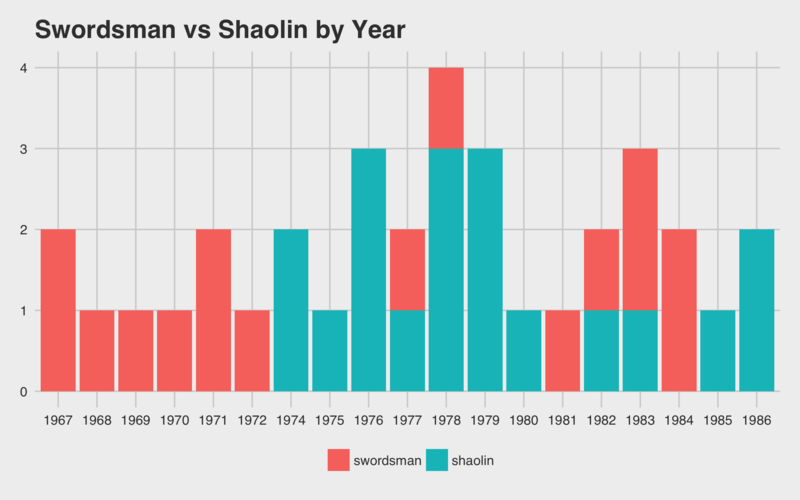 Now the count-per-year isn’t mind-blowing or anything, but it does seem interesting that there was at least one movie with “Swordsman” in the title for six straight years, before an explosion of “Shaolin”. I wanted to investigate a bit further. One of the first Swordsman movies they created was The One Armed Swordsman, and according to Wikipedia it was a big hit. It was the first of the new style of wuxia films emphasizing male anti-heroes, violent swordplay and heavy bloodletting. It was the first Hong Kong film to make HK$1 million at the local box office, propelling its star Jimmy Wang to super stardom. I must confess, being a casual enjoyer of Kung Fu, I was not familiar with the term “Wuxia”, so this needed a bit more investigation. The Chinese martial arts movie is generally split into two primary subgeneres: the kung fu film and the wuxia film. The kung fu film is newer and focuses primarily on hand-to-hand combat, it’s steeped in traditional fighting forms and there’s a general emphasis on the physical skill of the performer: special effects are generally disdained. Wuxia is a much older form, based ultimately in the long tradition of Chinese adventure literature … Its heroes follow a very specific code of honor as they navigate the jianghu, an underworld of outlaws and bandits outside the normal streams of civilization. Ah Ha! So the Swordsman / Shaolin dichotomy could be representative of the switch from this older style wuxia, to the new hip pure Kung Fu. The reappearance of both terms in the eighties could indicate a new found enjoyment for both styles. Apparently more famous modern films like Crouching Tiger, Hidden Dragon fall into the wuxia category. I say “modern” here, but can you believe this movie is 17 years old? Time flies! Or, it could be that the creators of these movies were lazy and just wanted to rely on the success of The One Armed Swordsman to make some money. Either way, its an interesting split. These films, focused on the Shaolin Temple as a center for anti-Qing resistance, provide a dizzying metaphorical potential, with the Qing variously standing in for Western imperialists, the Japanese, the Nationalist Kuomingtang, the Communists, or even simply the Manchurians themselves, while the Buddhism of the monks allows for examining of the contradictions at the heart of traditional Chinese belief systems, between the imperatives of social justice and withdrawal from worldly concerns. Inspired by the ever wonderful Lynn Cherny’s word2vec experimentation, I wanted to use this opportunity to experiment just a bit with word embeddings and “word arithmetic”. So I came up with an idea too silly to be useful, but fun for me to play with. For each noun detected in a title, I used Gensim’s word2vec implementation to find the nearest word to that noun, after subtracting “Chinese”, and adding another country. Again, don’t take this seriously, I was just wanting to see what would happen. See? kind of funny at least in theory. I did this for every title, for a number of different countries. In practice, the results aren’t as hilarious as I had hopped for, probably because country vectors don’t impact the trajectory of most of these words much. Also, I used a pre-trained model which obviously impacts the embeddings. But, I made a little toy for exploring these new titles anyways, check it out! The raw results and the code I used to generate these are also available. Let’s end this exploration with a few insights into the actors in these films. Even with my novice-level consumption of Shaw Brothers films, one thing you notice early on is a lot of familiar faces show up over and over in many of the movies. 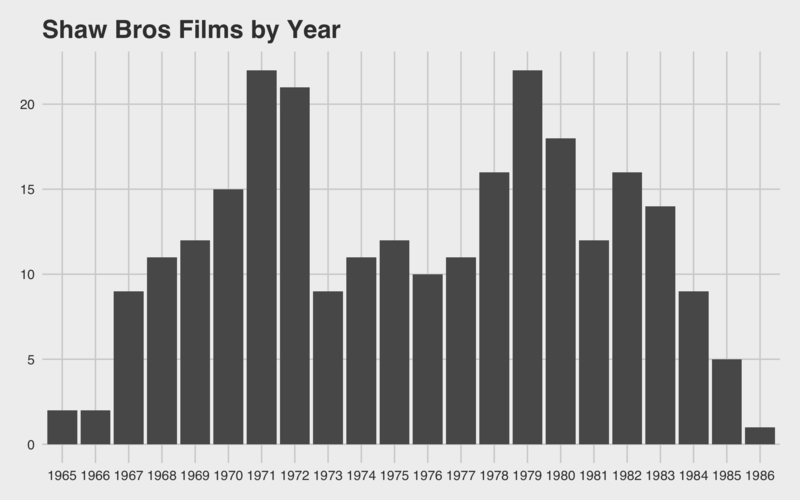 We can see the extent of actor-over-use with another simple chart counting the number of movies frequently seen actors are found in. Wow! Ku Feng apparently appeared in 82 Kung Fu movies. That’s a lot of Kung Fu! In 1965, Ku formally signed an acting contract with Shaw Brothers where he made around 100 films for them and became most notably known as one of their top character actors. He has worked with just about every top Hong Kong director in a variety of films. Ok then, well props to you Ku. 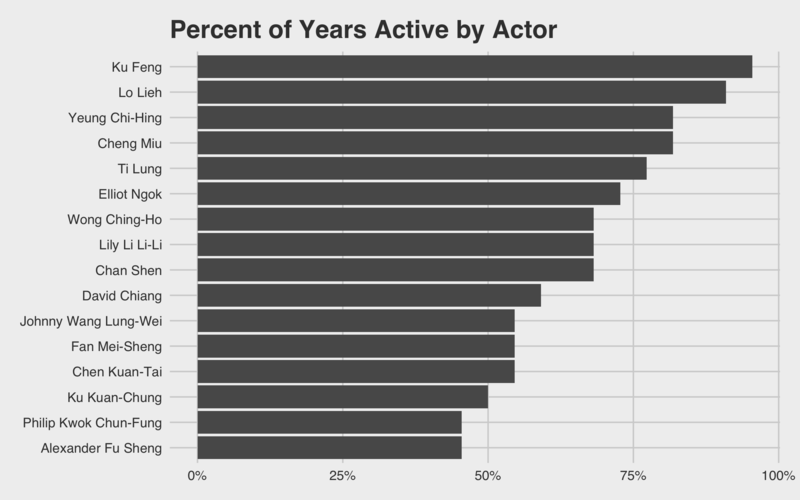 Did most of the top actors’ careers span multiple decades, or did actors come and go quickly? 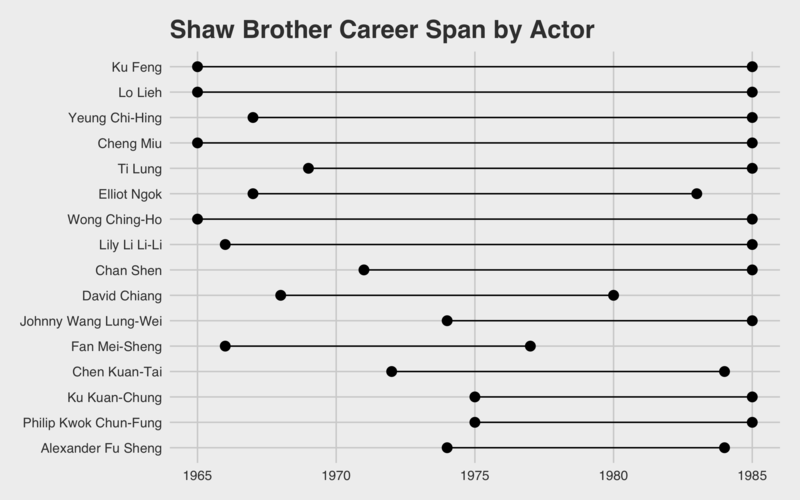 For the top actors, we see most were active more than half of the entire time Shaw Brothers Studios was making Kung Fu movies. One phrase that came up when researching these Shaw Brothers films, related to actor-reuse, is the Venom Mob, a group of actors that did indeed appear in a lot of Shaw Brothers films together. They became well known after the success of The Five Venoms, hence the catchy name. So, can we find a Mob of Venoms in our data? Inspired by David Robinson’s network analysis of Love Actually, I decided to try out the igraph package for a bit of network exploration. 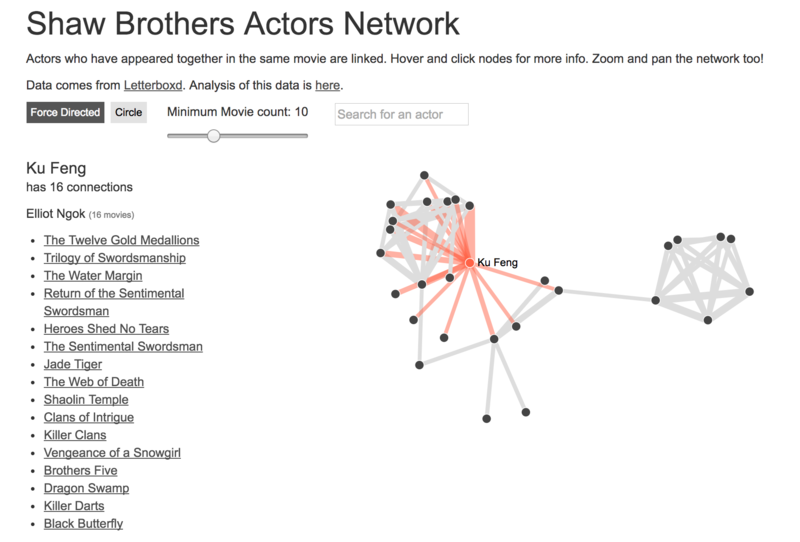 In this network, the nodes are actors who have appeared in many films. The edges are co-occurrences of actors in the same movies, with the width of the edges proportional to the number of movies they were found together in. You can see that there are a lot of actors appear together. 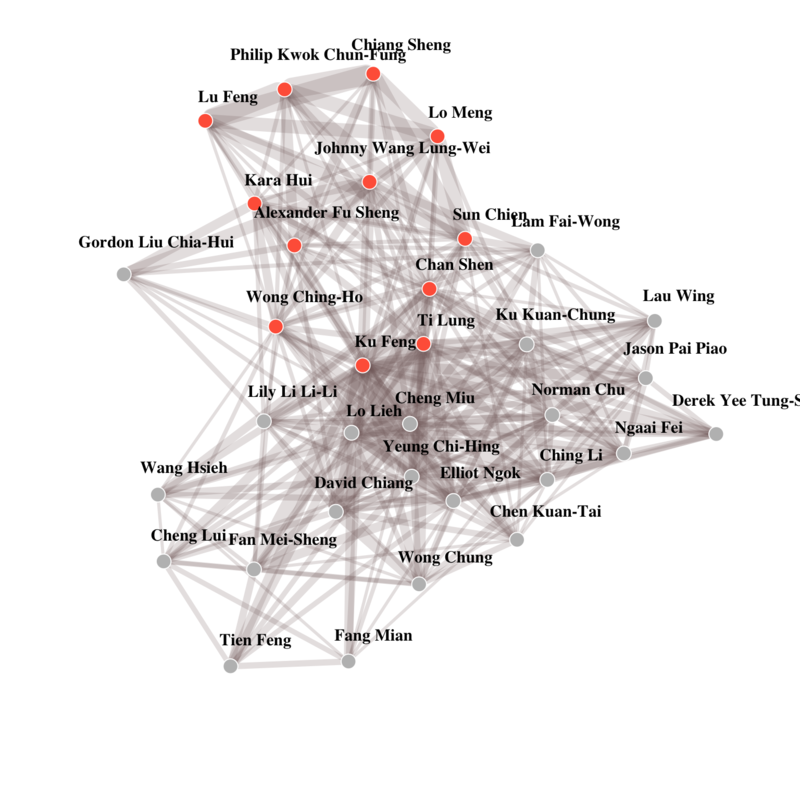 The Venom Mob includes Chiang Sheng, so here, I’ve highlighted in red everyone he is connected with. In this sub-cluster, you can see Philip Kwok, Lu Feng, and many of the other Venoms. igraph is great for digging into properties of nodes, edges, and networks - and there is plenty more that could be done in this tool just for this simple dataset. I however, was wanting a bit more of an interactive exploratory tool that I could use to browse Kung Fu actor connections. You were too? Great! That’s why I created the amazing Shaw Brothers Actors Network Visualization. With it, you can clearly pick out the Venom Mob on the right, in the screenshot. But that’s not all, you can also browse all the movies actors appeared together in, and modify the network in lots of fun ways. 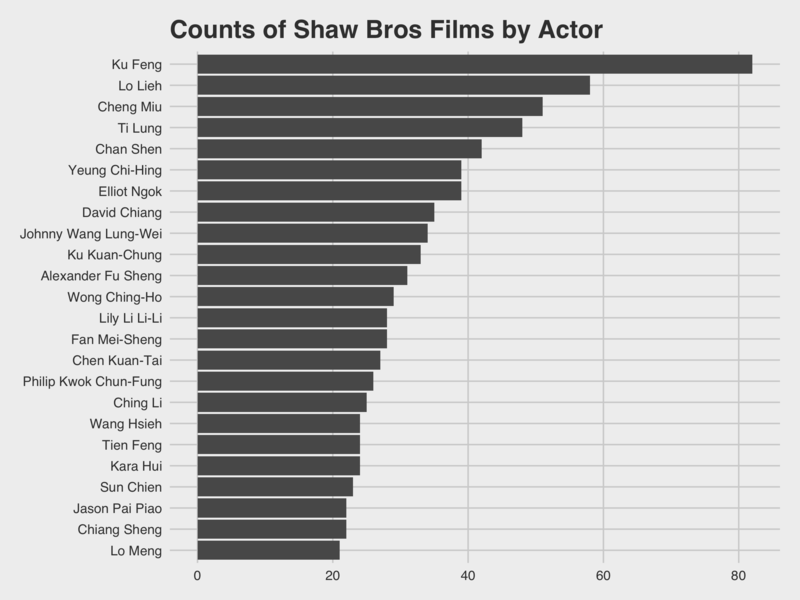 That wraps up my little data-driven exploration of Shaw Brothers films. As with any analysis, there’s plenty more to explore - but hopefully this was fun for you too, and inspires some data-driven exploration of your own.